“There’s no reason to be afraid,” my spouse scolded, as my 1-year-old and 4-year-old shrieked at the top of their lungs. You would’ve thought they were being roasted alive, instead of merely strapped into the Burley Encore X as their parents gingerly hauled it down a small, steep hill to the beach. For a minute, the stroller was poised over a three-foot drop. I held the roll bar from the top and lowered it to my spouse as I braced my feet on a tree root and thought, “Hey, I might start shrieking, too.” You can’t blame toddlers for tantruming when the tantrum makes perfect sense. Our kids are used to this. Ever since my son has been big enough to hold his head up on his own, we’ve been hauling them around in the active parents’ bike trailer of choice, a Thule Chariot. The Chariot has different iterations at different price points, but each iteration can be modified for jogging, biking, or cross-country skiing. 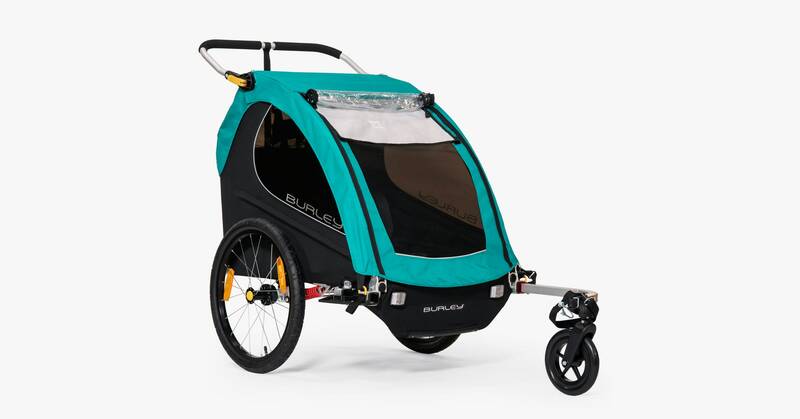 This year, Burley released a series of new, rugged child bike trailers. While the the Eugene, Oregon-based company is known for super-safe designs, it’s hoping that the new Cub X, D’Lite X, and Encore X will get more Burley trailers off the streets and onto the sand, snow, and dirt. I opted to test the Encore X performance sport stroller-trailer. It has suspension, in comparison to the more affordable Encore, but fewer of the luxury features of the D’Lite model. After a few weeks of testing, I still prefer our Chariot. But Burley’s many fans will find plenty of reasons to love the Encore X. The Encore X is easy to assemble and use. Like Burley’s jogging stroller, the Solstice, the manipulable parts are set off in bright yellow plastic, so you know exactly which parts you are supposed to wrestle with and which ones you should leave alone. At 31 inches across, it’s narrow enough to fit through our front door—just barely—and at 24.7 pounds, it’s lighter than our Chariot Cheetah, which weighs 26.5 pounds. It comfortably fits my two kids, but it’s worth noting that its total capacity is only 100 pounds. I’m probably only going to be able to carry both children in it for another year or so. I might be able to use it for a little longer if I can resist packing it full of stuff. The Encore X has an awe-inspiring cargo capacity. It’s hard not to start tossing random things into the 60-liter cargo bin, like picnic blankets, tennis rackets, or dog food. You can also remove the seats to convert it to a cargo trailer. It also comes with a one-wheel stroller conversion kit. To use it, screw the Burley hitch on your rear axle. When you want to bike, hook up the trailer hitch with by sliding in the pin and locking it; flip small front wheel up and you’re ready to go. When you want to convert it to a stroller, unhook the pin and flip the front wheel down. The transition is quick and easy, and unlike the Chariot, you don’t have to worry about finding a way to carry or store the hitch bar. Some convertible strollers, like the Thule Chariot, do have a sturdier ball-and-socket attachment in addition to a pin. Finally, the Encore X comes with all the standard features that help make the company’s trailers so beloved among biking baby-havers: it comes with a skid guard to protect the bottom of the trailer, and the wheels have guards and are easy to switch out with the pop of a big, yellow button. And the suspension works! I biked two kids and all their stuff on everything from dirt trails, to sand and gravel paths, and no one protested or cried (except for that one time). As a bike trailer, the Encore X is nearly perfect. For two weeks, I towed my children to and from school. A sunshade and UV-protective panels protected my kids from the sun, and the big storage container meant that I didn’t have to attach panniers to my bike rack to carry all their backpacks and jackets. I could throw in a friend’s skateboard in the back when he wanted to walk with us, or a basketball to play at the park. When I took it on more adventurous excursions, cracks began to show. The Encore X meets ASTM F1975-09 safety standards and survived extensive drop- and crush-testing thanks to its heat-treated aluminum roll frame, but I have some concerns with its durability. The first flaw is that the trailer’s handlebar doesn’t lock into place. When I picked up the bike trailer an inch or two to pull it around a gate or over a curb, the handlebar popped out, rotated, and plonked my children on the ground. When we had to lift the trailer over a log on the trail, my spouse and I picked the stroller up by its frame and ignored the handlebar altogether; it was just easier. Burley assured me that you can tighten the clamp to lock the handlebar in place. However, in order to do so, you need to pop out the barrel nut that holds the handlebar in place. And if you tighten it too much, you might snap the handlebar’s cinch lever. As I pondered this conundrum, I couldn’t help but think that a sport trailer should be a little hardier than this. I also wonder how long the Encore X will hold together. The fabric is made from tough 600-dernier polyester, but after a mere two weeks of being folded up and shoved in the back of my car, it has already started to wear through. The damage isn’t covered by the three-year warranty. Burley suggests a little Tenacious Tape might do the trick, but I’ve owned the Thule Chariot for three years and put it through similar paces, and its only signs of wear are fading from the sun. The Thule Chariot’s accessories also just make more sense. For example, the Chariot’s two-wheel stroller kit is included in the base price, whereas with the Burley, the two wheel stroller kit is an add-on. The one-wheel stroller conversion kit might be more convenient in some ways, but I missed having two wheels. They make the stroller smaller and easier to maneuver, and I wouldn’t want to pay extra for them. I was excited to test Burley’s sand- and gravel-riding kit, but I found that the big, fat, 16-inch tires were unnecessary. If you want to bike to the beach and push the stroller through sand, you have to buy the $149 jogger kit on top of the $199 fat tires. Without the jogger kit, the puny front tire sunk into the sand, tipping the stroller forward. If you pick the Encore X, my advice is to skip the sand kit and stick with the ski kit for snow. Opt for the jogger kit if you want to go on sand or trails, or the two-wheel kit if you live in a city. If you want a one-and-done bike trailer that you can also hoist over a tree root without your children screaming, my vote would still be for one of the Thule Chariots like the one I recommended in our Best Strollers guide. Still, I found it to be a surprisingly difficult decision. The Encore X has many admirable qualities, especially if you don’t go off-roading very much. It’s lighter and narrower, with much better storage options. With a few refinements to improve its durability, and a little Tenacious Tape, I might see a lot more of these on the roads and trails this summer.